This year Sea Mills estate celebrates its Centenary. The new suburb was built on land owned by Philip Napier Miles, and, although not his project, saw the realisation of a long-held ambition to create a garden village. It’s not clear what first inspired PN Miles to dream of developing his lands on along the revolutionary principles of the Garden City Movement, but he was an early adopter. Perhaps he’d read Sir Ebenezer Howard’s ‘To-morrow: a Peaceful Path to Real Reform’ that set out the ideology of uniting the benefits of open green space with new urbanization and industry. 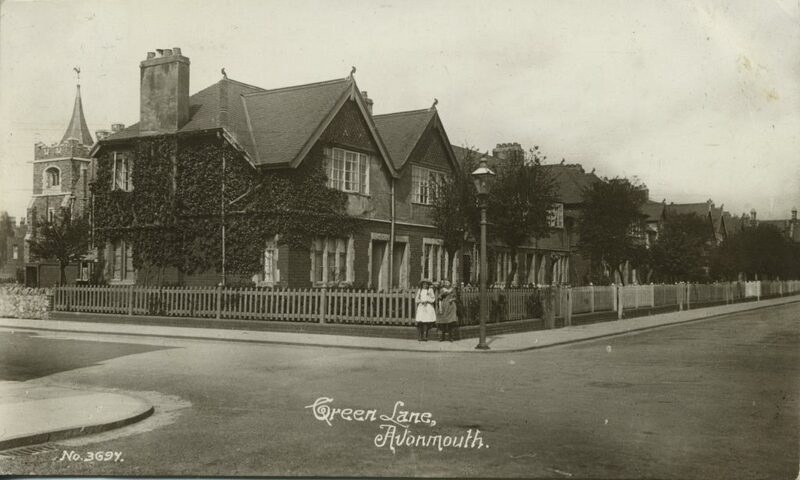 If he read it in its first year of publication, in 1898, he was quick to respond as the architectural character of housing around Avonmouth changed almost overnight, from traditional Victorian terraces, to new model housing in the Arts and Crafts style still found along Green Lane. 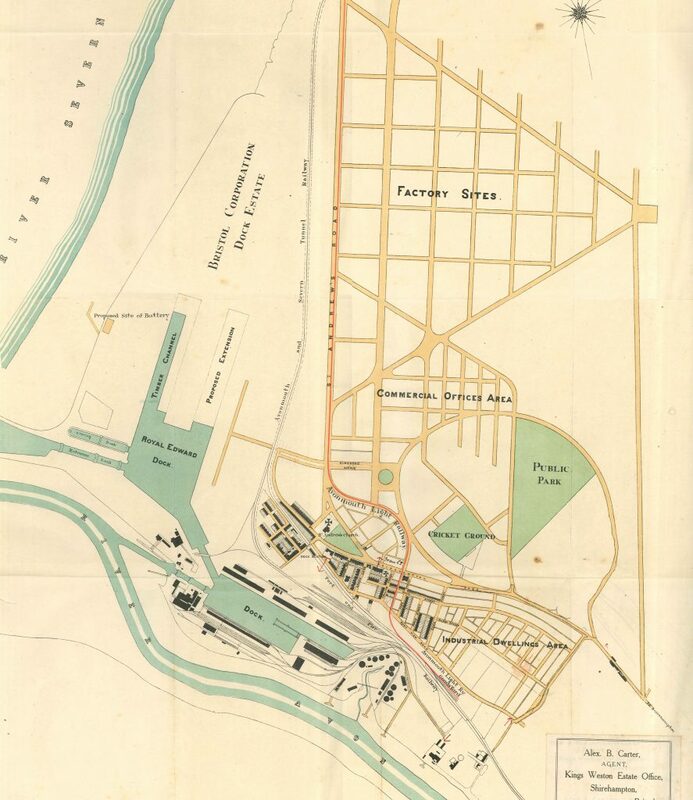 The idea quickly expanded and in March 1903 Miles published his grandiose plans for developing thousands of acres of land around Avonmouth along Garden City ideals. 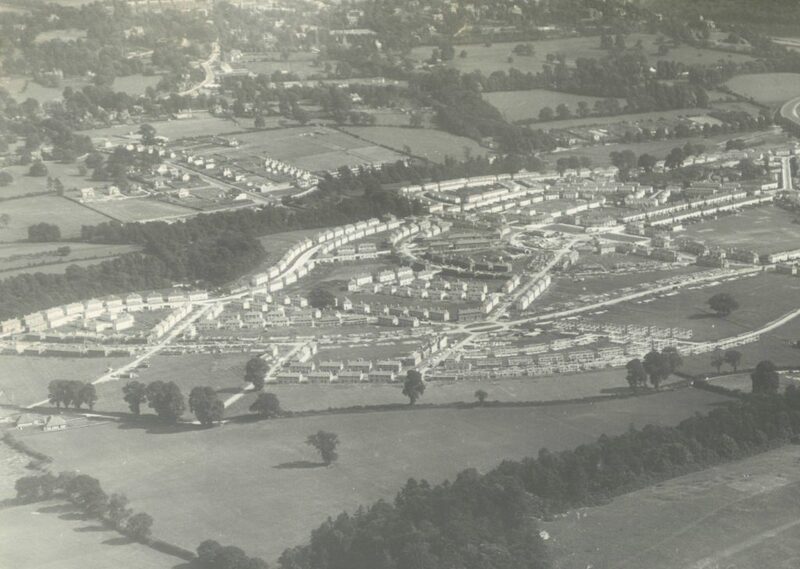 This was the same year as the foundation of Letchworth Garden City, the first realised town plan using the same principles, and the architecture around Avonmouth is still strongly reminiscent of the more famous settlement. Although heavily marketed the Avonmouth city project never really gained traction. Investors were reluctant to commit to a damp, wet, floodplain that was only poorly connected to the city centre of Bristol. However the wide streets, and elaborate Edwardian architecture suggest at the aspirations Miles had. Even as Avomouth was undergoing tentative development another opportunity arose for Miles to achieve his ambition; that being the Bristol Garden Suburb Ltd. Miles was approached in 1909 by promoters of a smaller scale development inspired by the garden-city principles that would provide pioneering artisan and workers housing with high quality living conditions and generous gardens front and back. Miles sold a portion of his estate off Station Road in Shirehampton at extremely reduced cost to see if the experiment would succeed, and gave the option to acquire more land if it was a success. The project was realised and although only 44 houses had been built by 1913 it remained incomplete. Today the garden village can best be seen around Passage Leaze where it has been surrounded with later council estate development that muddies its real significance. 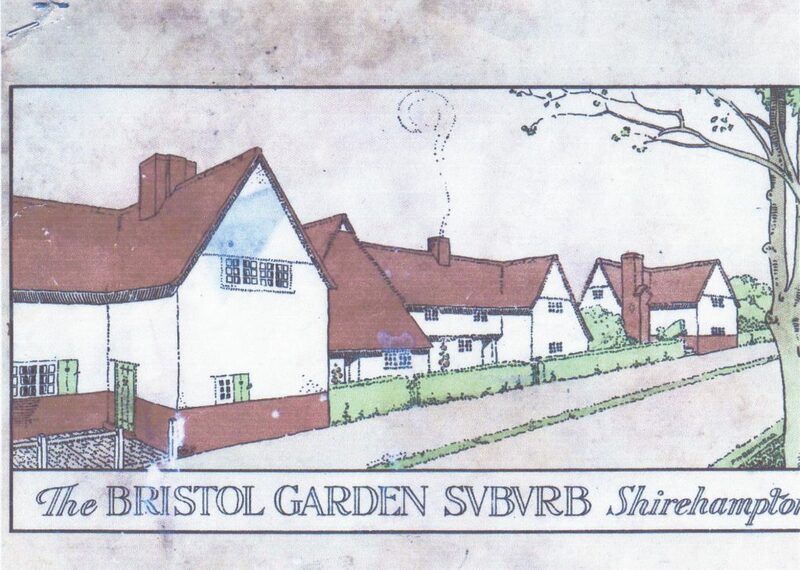 Houses on Springfield Avenue from the Bristol Garden Suburb Ltd prospectus. Miles remained committed to developing a much larger garden suburb on his own terms and, in 1918 a new plan was formed to develop 350 acres of the Kings Weston estate below Penpole Wood and where Lawrence Weston is today; 60 acres of this were scheduled to be open green space. A 1919 newspaper report describes the visit of the Garden Cities and Town Planning Association when Miles took the opportunity to describe his plans and the progress then being made on them. The first public building was to be a Trades Hall for the use of trade unionists, new education facilities, communal laundries, baths, swimming pools a main avenue of two miles in length, and a shopping centre were to incorporate elements of the landscaped parkland below Kings Weston house. Sadly there aren’t any surviving plans for Miles’s ambitious scheme, but part of it was realised in the form of about 100 houses below Penpole Point, around Bean Acre and the western ends of Old Quarry Road and Kings Weston Aveunue; the latter being the commencement of the 2-mile long avenue planned. 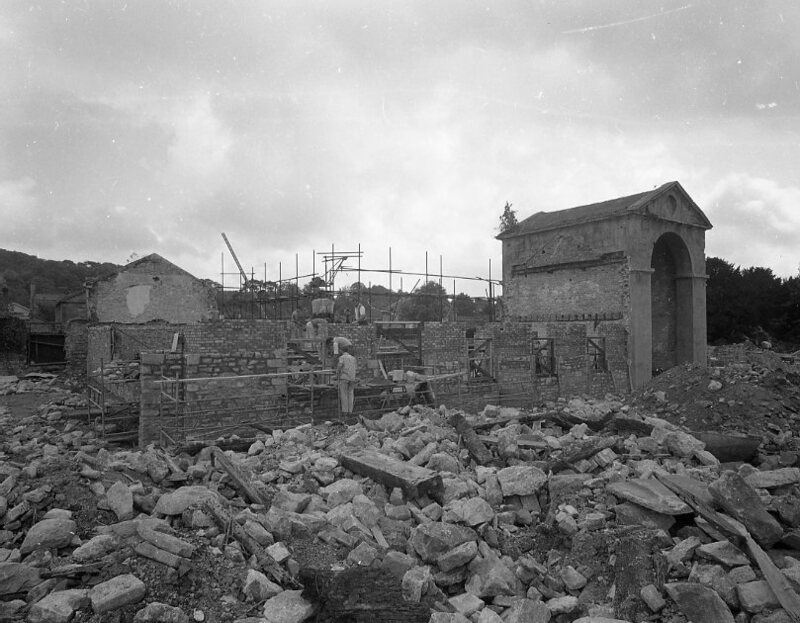 The works were undertaken by the Ministry of Munitions and it appears that Miles had limited control of the appearance of their work driven by the wartime need to supply workers housing for the Government zinc smelting works and the Mustard Gas factory at Chittening. Kingsweston Garden Village seen from Penpole Point Above. Note the quarry that was brought back into use for the construction. 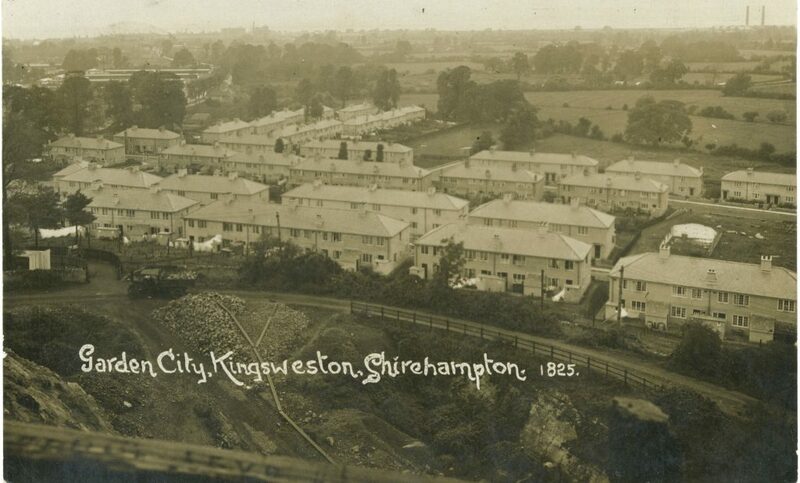 It’s not known why the Kings Weston Garden City faltered after such grand plans, especially following the 1919 Housing and Town Planning Act, promoted by politician and doctor Christopher Addison, gave Local Authorities the power and money to act to help resolve a chronic housing shortage. Instead Bristol Corporation focussed attention on another large tract of Miles’s estate: Sea Mills. Miles bought into the idea and he happily negotiated with the Council to sell the 205 Acres of land required, but with three clear provisos that ensured he retained considerable control of the design. These were: 1. “that no part of the said lands…shall be used for any purpose other than that of a Garden Suburb”; 2. that the density “shall amount on an average to not less than 8 and not more than 12 per acre; 3. “that the said lands…shall be laid out and built upon in accordance with a scheme which shall be previously prepared in consultation with the Surveyor and Architect employed by the Vendor”. 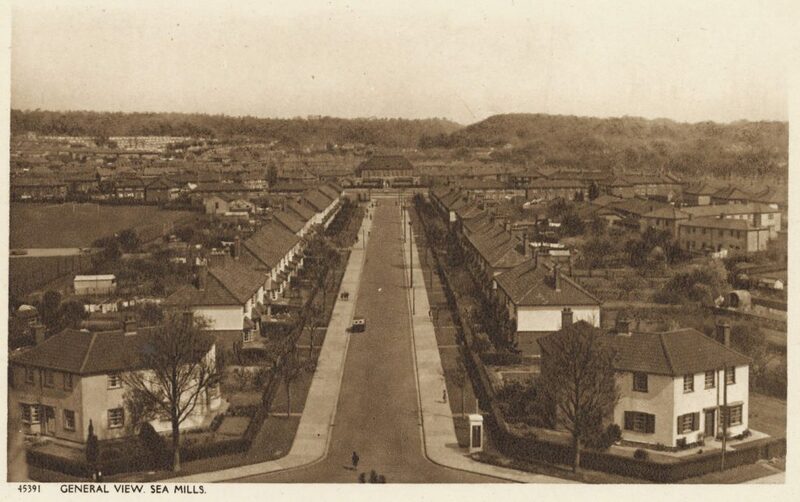 Sea Mills Garden Suburb during construction in the 1920s looking southwards with Kingsweston Hill in the right-foreground. 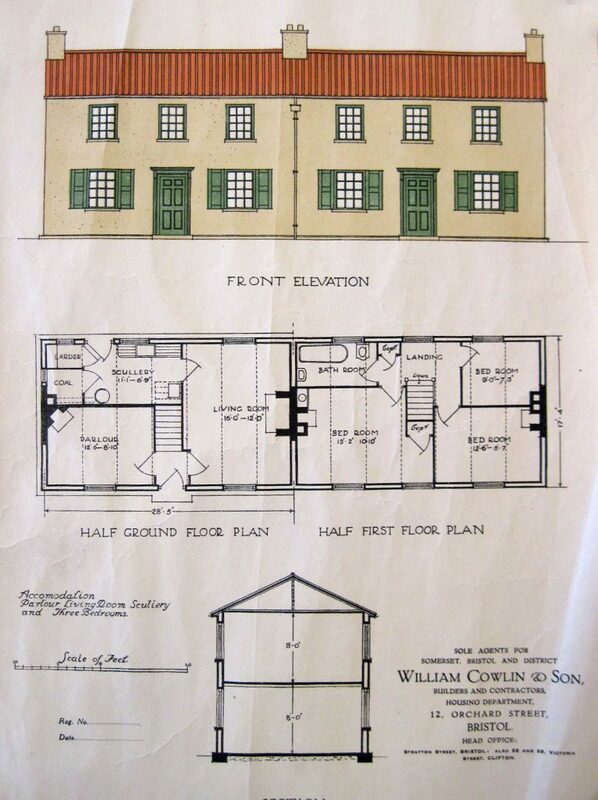 One of the house types that Philip Napier Miles was required to approve the design of. In June 1919 the architect of the social reforms that had enabled the foundation of Sea Mills, Christopher Addison himself, cut the first sod on Sea Mills Square and symbolically planted the ‘Addison’s Oak’. The plans closely followed the Garden City principles, applied to a suburb, ensuring generous green spaces, civic, educational and social buildings planned as a unified and integrated whole. Miles further augmented the new suburb with the gift of open spaces, and the donation of Shirehampton Park to the National Trust for the enjoyment and recreation of the new residents. In this Centenary year for Sea Mills it should not be underestimated the vision of men and women to provide humane, healthy, and dignified for their fellows. Amongst those people we should remember Philip Napier Miles and his devotion to the Garden City ideals; Sea Mills Garden Suburb must have given him pleasure as the most complete realisation of the dream he harboured for two decades. A view looking up St Edith’s Rd from the church of the same name, and towards the central square of Sea Mills. The Centenary of Sea Mills is being celebrated by the Sea Mills 100 project with a series of events throughout the year, and the launch of a micro museum in a restored telephone box in the village centre. More information can be found here. For more information on Sea Mills suburb the Conservation Area Statement provides more detail. This entry was posted in Uncategorized on April 9, 2019 by David Martyn. Two items of Kings Weston interest recently appeared in auction in Gloucestershire. Two paintings, both dating to the 1840s went under the hammer on the 7th. The first was a small and somewhat naive depiction of Penpole Point in oil. This small painting was unsigned and a little mangled. The view included Penpole Lodge and the dial further along the ridge, but all concertinaed into a compressed space with some alarming perspective at play! It was also odd in showing the dial raised on a mound, perhaps for artistic effect as we know it never had this pronounced feature. 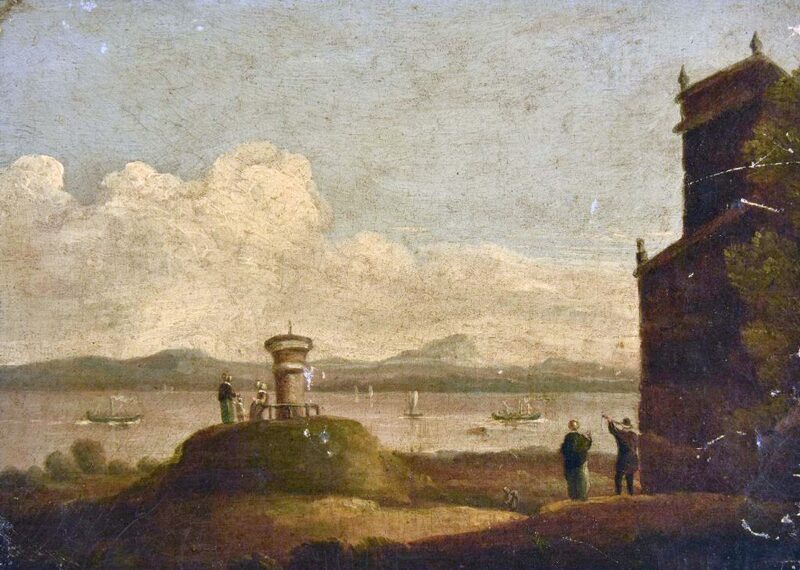 The painting shows some of the many visitors who came to Penpole Point to take in the views; one even holds a telescope to out on the early steamships plying their trade on the Severn. Oil painting showing the view from Penpole Point. Penpole Lodge is on the right. The other painting is a large watercolour depicting the staircase in Kings Weston house by Thomas Leeson Rowbotham and is of historic as well as aesthetic interest. 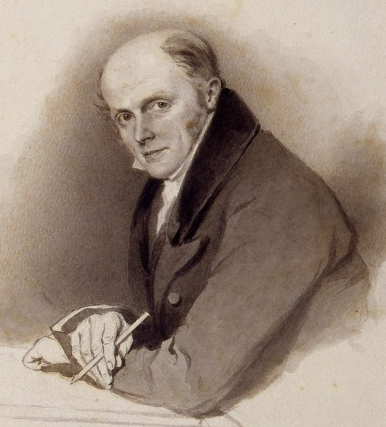 Rowbotham (1782-1853) was born in Bath in 1782 where he worked as a teacher of painting. He lived in Bristol from about 1825-35, where he made many drawings for G. W. Braikenridge who famously commissioned hundreds of paintings documenting the old city of Bristol in incredible detail. Over 400 of Rowbothom’s paintings form part of the museum’s Braikenridge collection. Rowbothom must have impressed the Miles family, owners of Kings Weston from 1835, as he was commissioned to paint the interior of both his mansions: Leigh Court and Kings Weston. A painting of the Drawing Room at Leigh Court is in the Bristol Museum collections. 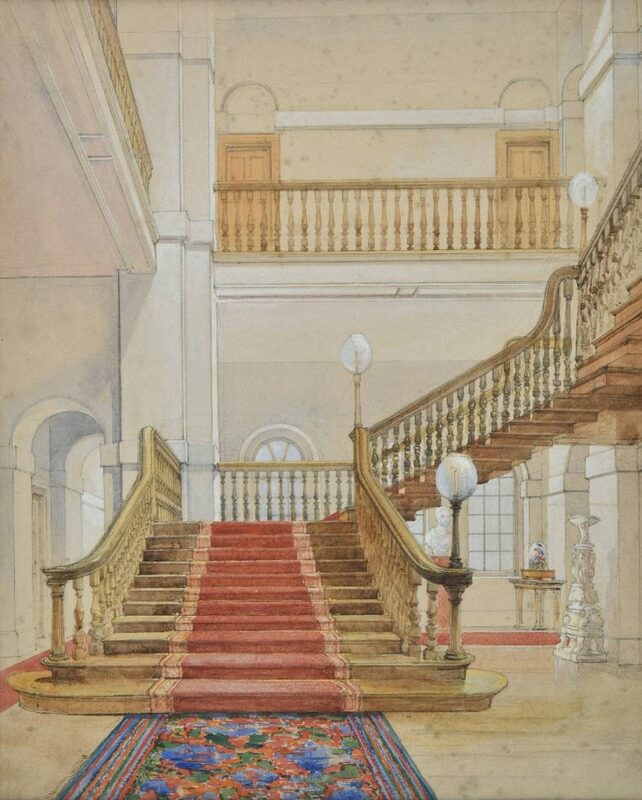 Rowbothom’s June 1848 view of the newly finished stair hall in Kings Weston house. The Kings Weston painting is dated, June 1948, and this too is significant. After the death in 1845 of his father, Philip John Miles, his son, Philip William Skinner Miles decided to use his inheritance to refurbish Kings Weston as his new family home. Part of his works were to demolish the ancient arcades that filled the stair hall of the house and open up the space with wide galleries and a new top-lit ceiling. The centrepiece of the space was to remain the original staircase designed by Sir John Vanbrugh and installed by 1716. This work began in 1846 and concluded with a ceremonial dinner for the labourers on August 21st 1847; this was held in the George in Shirehampton and not in the house itself! Skinner Miles appears to have commissioned Rowbothom to record the brand new interior he has just created. Everything looks neat with only a few belongings having yet been set up and paintings and furniture that later occupied the space not yet installed. The gas lamps fitted to the stair newels are feature now missing, but the scene is little changed today from Rowbothom’s meticulous depiction of the newly finished hall. This entry was posted in Uncategorized on March 11, 2019 by David Martyn. Last month we brought you some First World War images from the archives of Avon and Somerset Constabulary, but there are many other interesting finds in their collection. 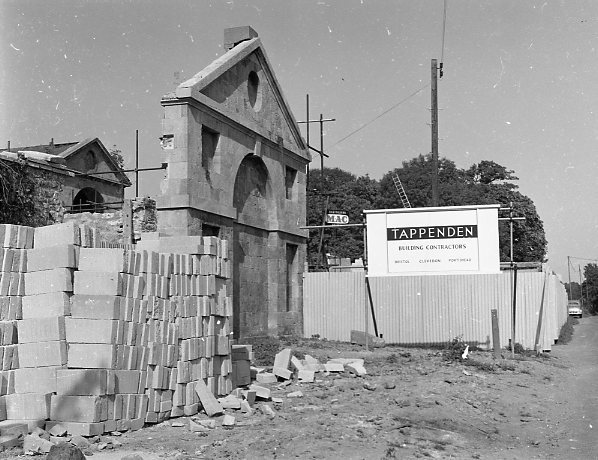 This month we reveal some alarming images of the Georgian stables on Napier Miles Road. 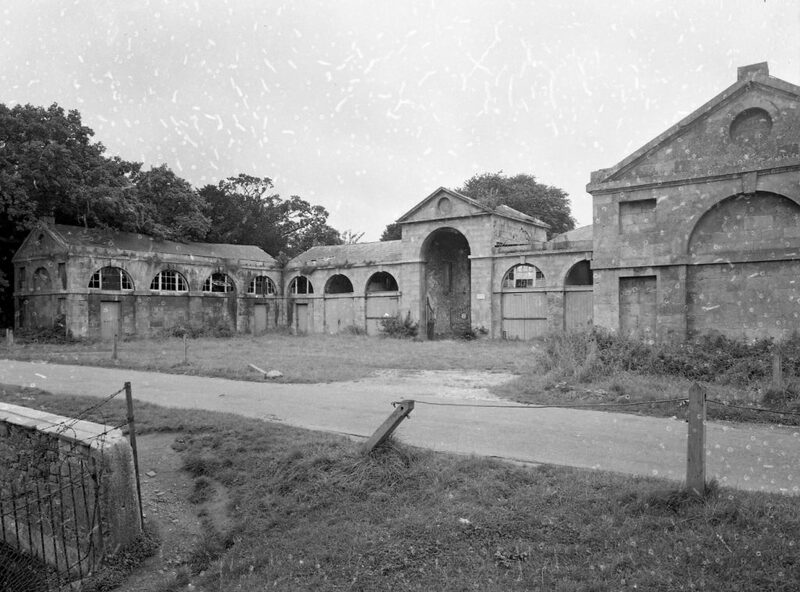 The stables were built in the late 1760s by the architect Robert Mylne shortly after his return from study in Rome. It was perhaps here that he had come into contact with the young Edward Southwell III of Kings Weston who would give him this prize commission before allowing him free-reign in remodelling the interiors of the house itself. 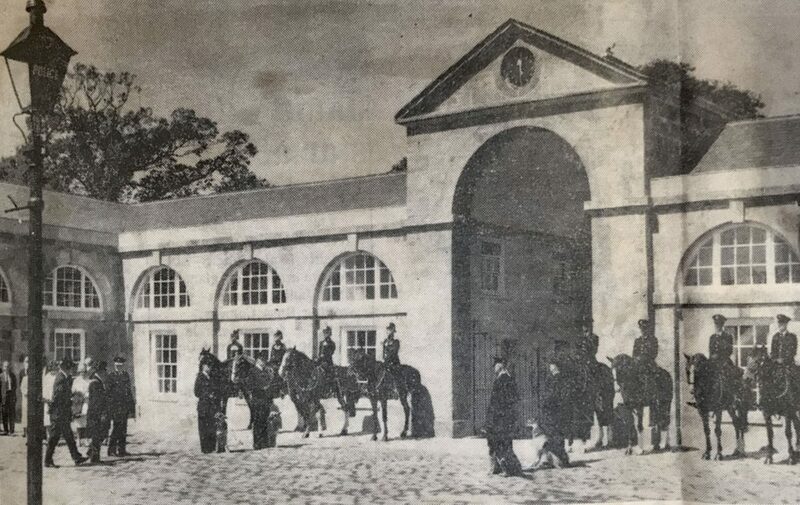 The stables and carriage houses continued to perform their original function until 1935 when the last private owner of the house, Philip Napier Miles died. His widow retained the walled gardens, where she built a new house for herself, and the stables, but the latter structures fared badly during the Second World War when they were used as billets for British soldiers employed in the house. By 1952 the building was ruinous, its roofs collapsing, and under threat of demolition. It was only through the efforts of local conservationists and the strong advocacy of Lord Methuen that the City Council conceded to keep the building and rebuild it as a new police station to serve the fast-growing Lawrence Weston estate below. What has not been clear until now was the extremes that the ‘restoration’ had gone to in rebuilding the structure for this new use. 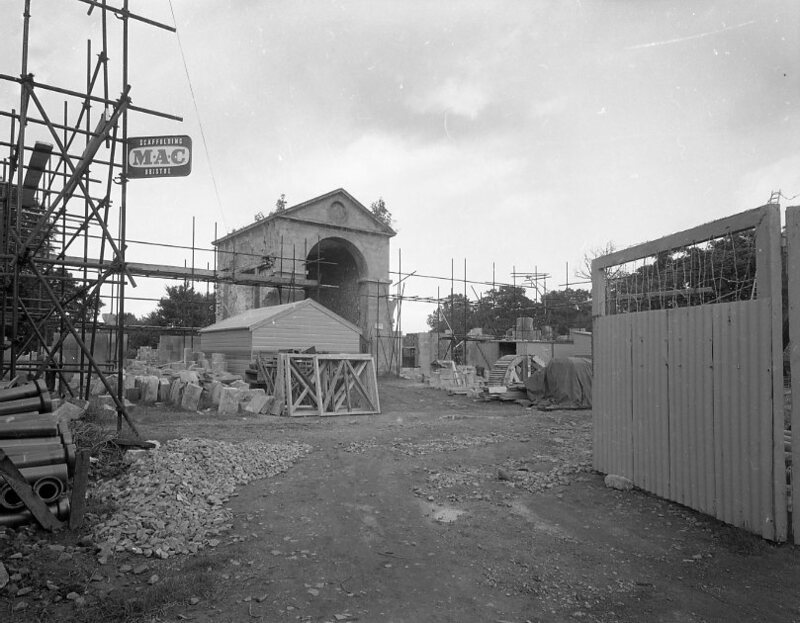 The stables in the process of being reconstructed, seen from the north, behind the building as it stands today. These photos show how much of structure was dismantled before being put back together. Remarkably only the central arch and the end facades of the two wings to the road appear to be the only elements that survived unscathed. The whole of the rest of the building has been taken down and, presumably, the most important masonry carefully numbered for later restoration. The building was formerly opened as a police station in May 1962 by the Lord Mayor, local MPs and numerous local dignitaries. Lord Methuen also attended and expressed his complements to the City Corporation on the vision and foresight they had shown in putting the buildings to their new use. He said” I remember when nothing seemed to move anyone to preserve the place and that is why I am so pleased to be present among those who saw the possibilities of not only retaining the buildings, but putting them to such a practical use” . 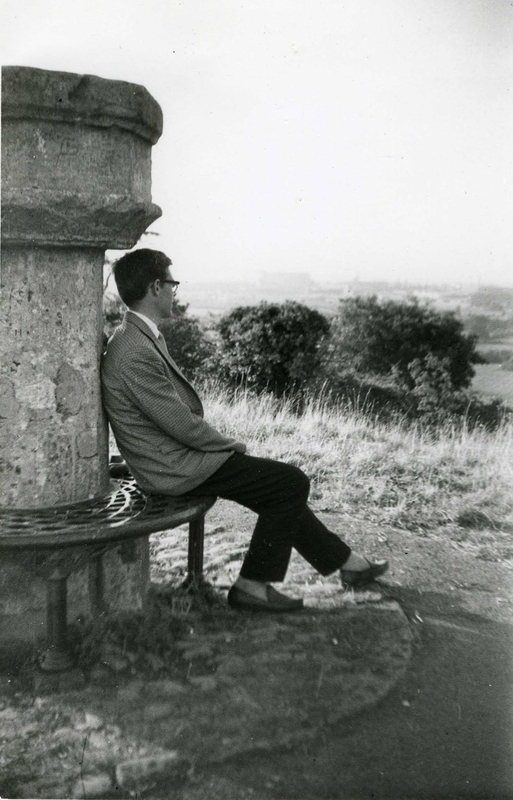 He continued that in most places these days there was a curious view that one should regard historic places on the basis of whether or not they could bring an income, but here was a refreshing change. He hoped Bristol would now consider preserving some more of her architectural heritage for posterity. This entry was posted in Uncategorized on January 11, 2019 by David Martyn. 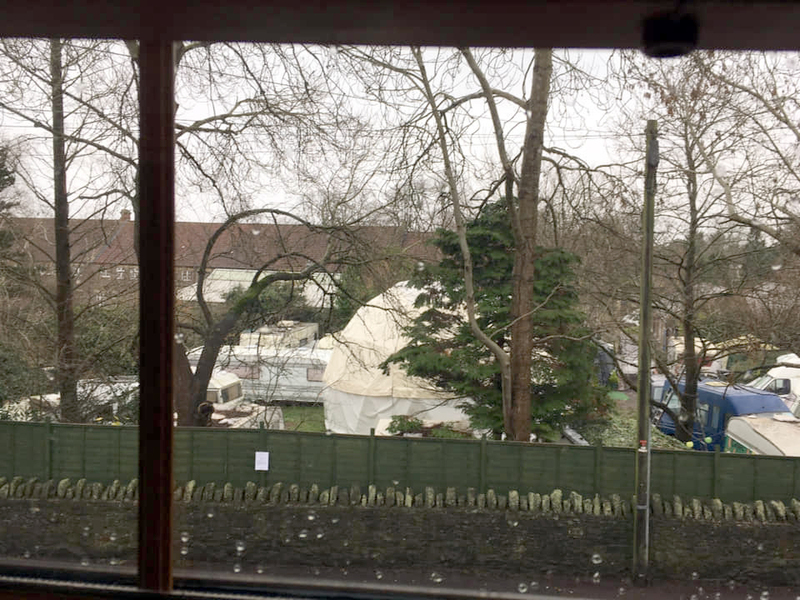 Some of you will already have heard this good news through our Facebook page, but we are delighted to hear that all of our worries over the use of the land around the Karakal warehouse on Penpole lane have just evaporated in time for Christmas. Keith Sawyer of Karakal wrote to us and confirmed that he has just managed to exchange contracts, with Matthew Webb, whose family have owned the site for about thirty years, and now owns the area of land around the Karakal industrial unit. 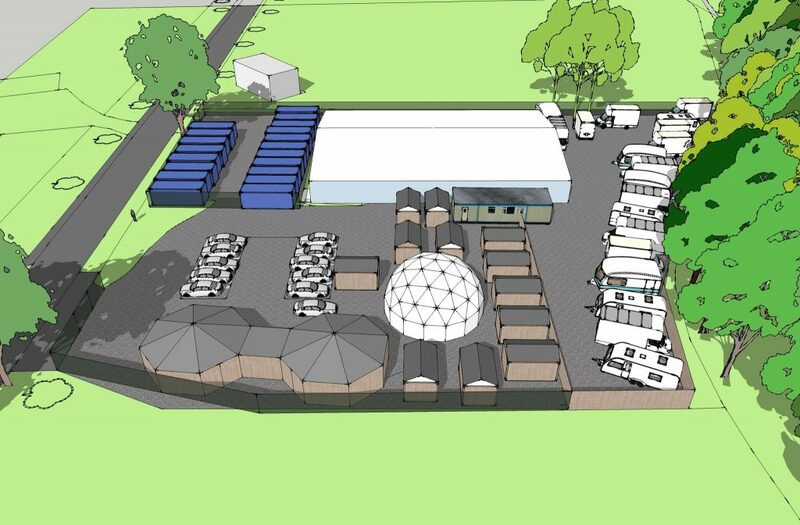 The planning appeal for shipping containers has since been withdrawn, and YardArts will be unable to move onto the site; Keith has confirmed this to us and we join in him in his celebration and relief that the whole plot is in his hands. Karakal have only ever had rights of access and parking on the land around their unit since 1987 and, although they have always been keen to, have never been able to agree on a realistic price for the land with its owner. They have shared our exasperation over many of the planning applications over the last few years that would have impacted on their business. We’ve been in contact with Mr Sawyer for a while and we are reassured that he has no plans to expand Karakal and that the land is now in safe hands. Naturally we were unaware of negotiations while they were happening, but we are incredibly grateful for Keith having emailed us just 10 mins after the exchange to let us know! It will be great to be able to direct our time and effort towards more constructive projects in the coming year rather than dealing with the planning problems we’ve been reporting on since 2011! We hope you will join us in celebrating this news!. Finally a BIG thank you to everyone who has supported us in objecting to the planning applications on this site; It’s been frustrating and draining, but all of your letters of objection have made a difference and have fended off development . We couldn’t keep going without your help and support! This entry was posted in Uncategorized on December 17, 2018 by David Martyn. In poignantly timely discovery, days before the centenary of Armistice Day, we found a series of photographs of Kings Weston dating to the First World War. 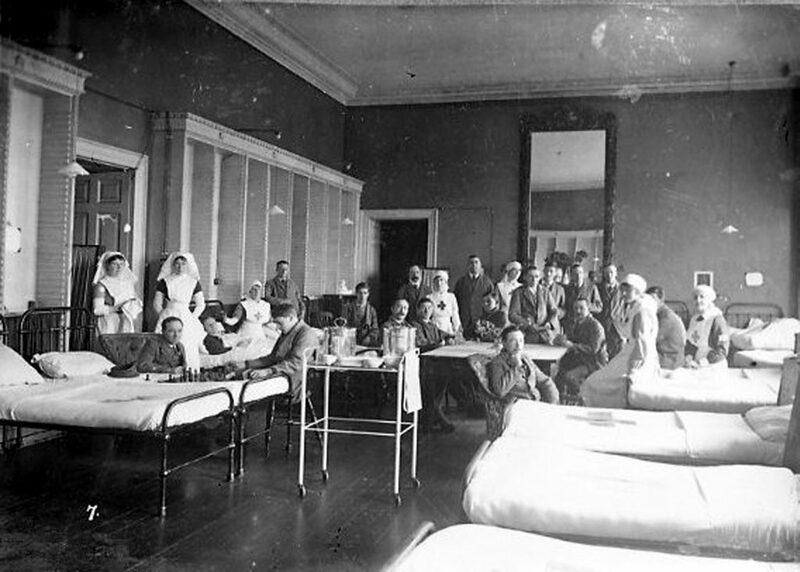 We’ve previously shared photos of the outside of the house during its time as an Auxiliary Hospital caring for the wounded sent back from the front; this new series of images shows the grand state rooms reutilised as hospital wards. The ante-room, now the Breakfast Room has changed remarkably little. 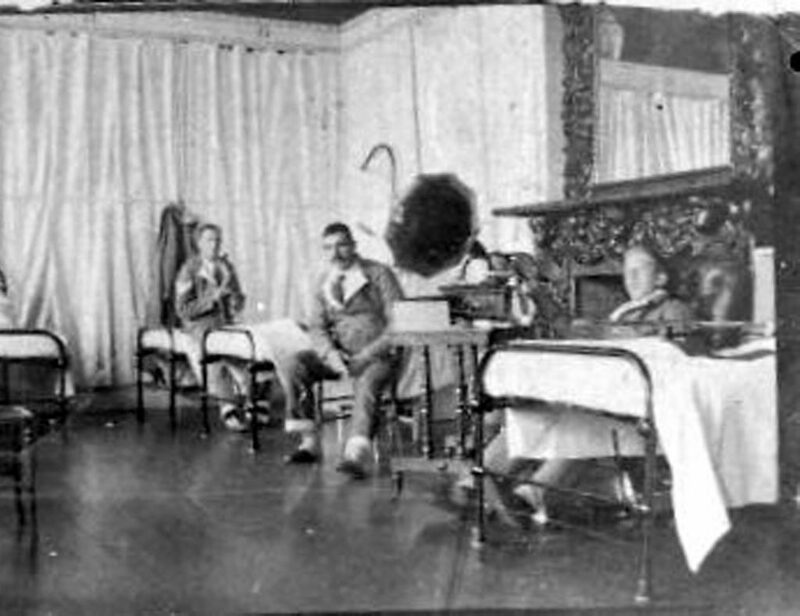 The wounded and nurses relax for the photographer. The interiors are shown emptied of their ornamental furniture and paintings and laid out with beds for soldiers. 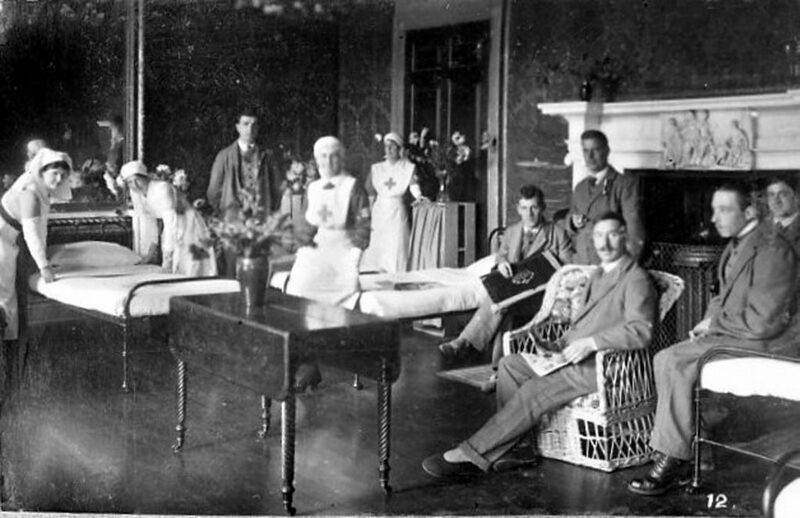 The Vanbrugh Room, “breakfast room”,and Drawing Room (now the oak room) are all seen in duty as wards, where Red Cross nurses tend to their patients. The largest of the wards, now the Vanbrugh Room is seen with empty bookcases and around sixteen simple iron beds. 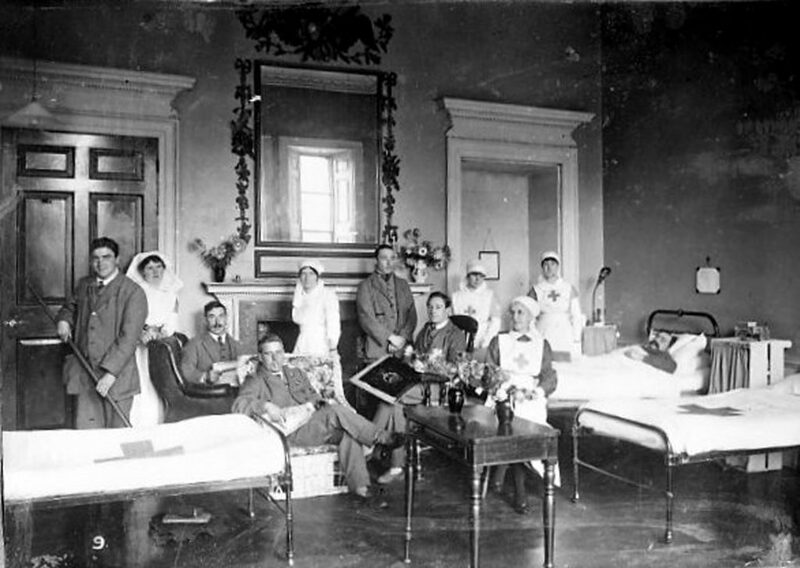 All the images show small groups of wounded servicemen surrounded by the volunteer Red Cross nurses who tended to them. Surprisingly the rooms are adorned with numerous vases of flowers. The Drawing Room before the marble fireplace was removed and the windows in the main front re-opened. Notice the quantities of cut flowers. Some of the photos are numbered and we’d be keen to find the rest. If anyone knows where these originally came from we’d be keen to find out, and we’re trying to speak to the Avon and Somerset Constabulary archives from where the images first came. We’ve also collated the known records of Red Cross nurses who worked at the house from the national database of First World War volunteers which can be found in thisPDF. Many were local ladies who wanted to make their contribution to the war effort, including three members of the Moore family from Penlea in Shirehampton. It’s likely that some of these nurses are those who appear in rediscovered photos. The Vanbrugh Room looking towards the wall that now features the mural. A group shot showing patients and nurses posing for the camera. This entry was posted in Uncategorized on December 9, 2018 by David Martyn. 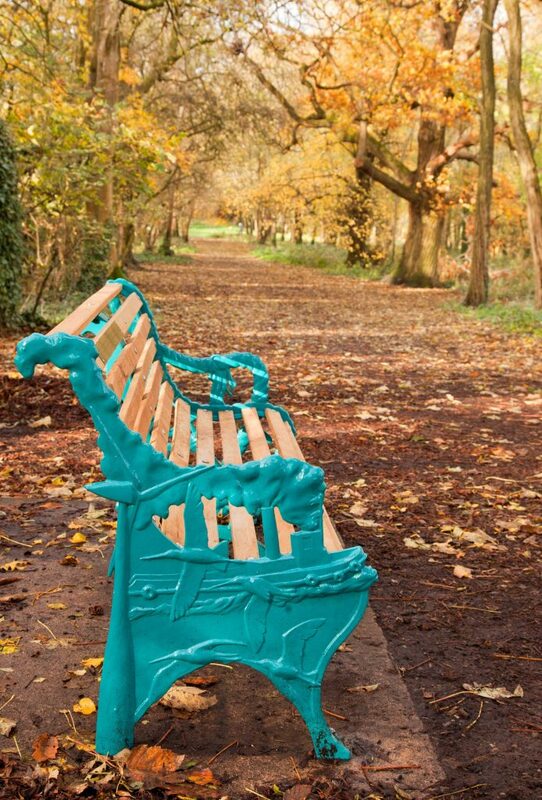 Recent visitors to Kings Weston cannot have missed the appearance of a new cast iron bench on the South Walk;It’s almost luminous colour was something of surprise when it was installed as part of the closing project of the Forgotten Landscape project.KWAG have worked with Forgotten Landscape and their artist, Deborah Aguirre Jones, on the design and the location for this bench, one of several installed at special locations in the area. 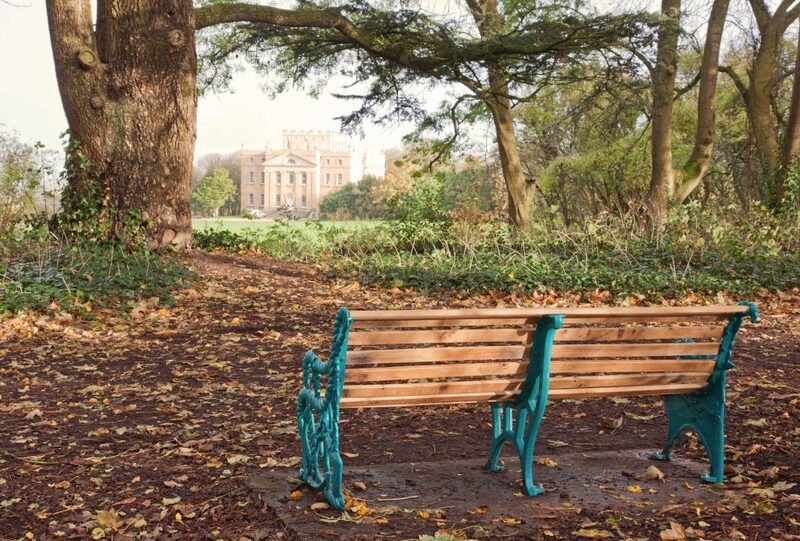 The design of the bench ends is different at either end; on the west side the arm and anchor motif is the arms of the Miles family who lived at Kings Weston house between 1834 and 1936 and developed the docks and Avonmouth. On the east side the natural and landscape qualities of the area are celebrated, including one of the wind turbines that feature in the view from the South walk. The location was carefully picked in partnership with the artist. From the bench you can enjoy a view of Kings Weston house with the Severn estuary beyond, framed beneath one of the huge cedars that line the path; a prospect that KWAG’s volunteers restored afew years ago. 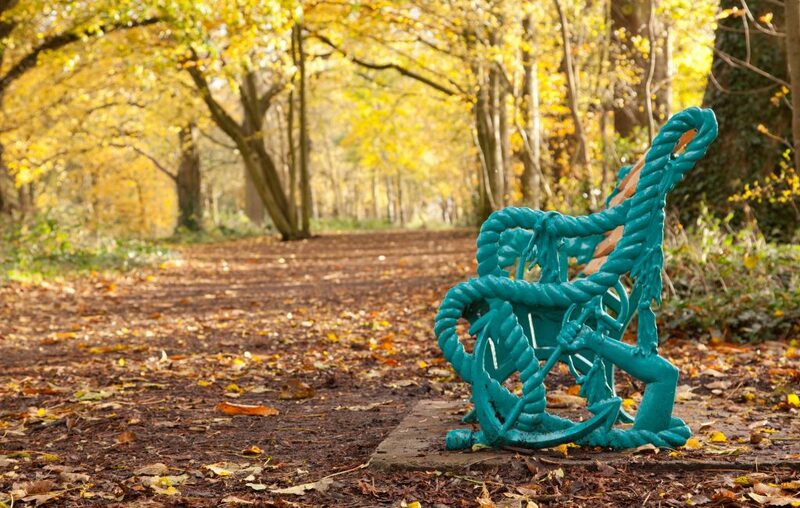 This bench is a one-off artwork in the park, and doesn’t set the pattern for future installations on the estate, rather it will remain as a unique and special addition that we all hope people will enjoy for generations to come. 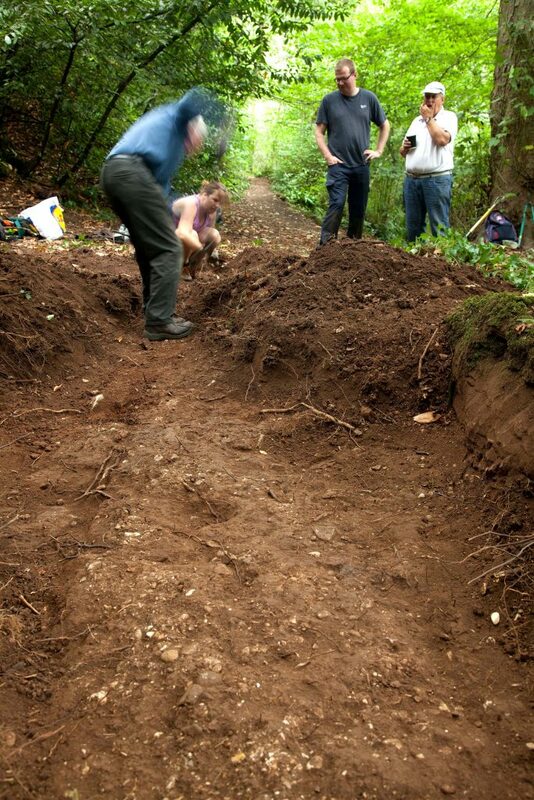 KWAG volunteers working on excavations. At a depth of approximately 20 inches there was a clear layer of rounded river shingle, unusually pale or white, and smooth in nature. Shingle varied in size between 2-inches to grit. This surface was a distinctive and unbroken horizon which was tracked-back in a northward direction where it met the back edge of the boulders. An abrupt edge in the surface was identified to the south of the trench three feet out from the boulder. 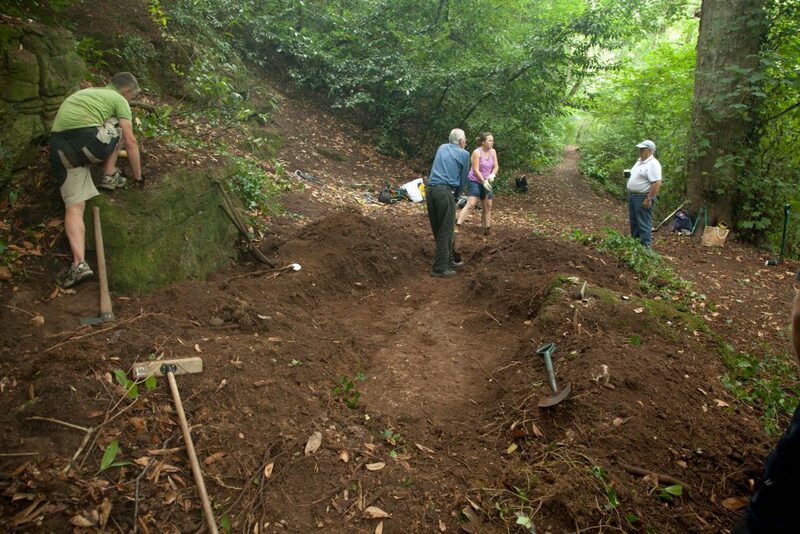 The trench was enlarged east,west, and south to discover the extent of the shingle surface and explore the context between it and the natural cliff to the back of the site. View looking west showing the shingle surface and distinctive edge aligned with the modern path beyond. The surface continued east and west, maintaining a clear delineation along its southern edge, and ran approximately parallel to the main path to the North. The eastern end began tracking around the boulder though its southern edge became indistinct and it was not possible to determine if the feature curved northwards with confidence. The west end of the feature continued in a straight line and apparently in alignment with the existing path further off inthe same direction. The discovery of some rocks along the straight edge of the shingle feature could suggest they’d been intended to delineate that edge; although found at depths consistent with the shingle layer these were only haphazardly and sporadically found, and not conclusively associated with the defined edge. Following recording the trench was locally dug deeper through the shingle layer to establish its depth and any build-dup. The opportunity was also sought to explore whether hole in the shingle surface was a post-hole. The Layer was surprisingly thin, no more than an inch in depth, and with nosub-base. Shingle was spread across the natural earth and no further features were identified below it. The possible post-hole had no corresponding features below the shingle surface that supported that initial interpretation. The site viewed from the east. The rocky outcrop at the back of the site, on the left, the low boulder along the path, on the right, and the alignment of the shingle feature matching that of the modern path stretching into the distance beyond. It was surprising that there were so few features identifiable across the rest of the site; there was certainly nothing that could relate to the distinctively crescent-moon shaped structure shown in the approximate area in 1772.That the excavated path was such a strongly linear feature suggests that the exposed rocks were a feature to be enjoyed as they were passed-by, rather than a place to dwell. 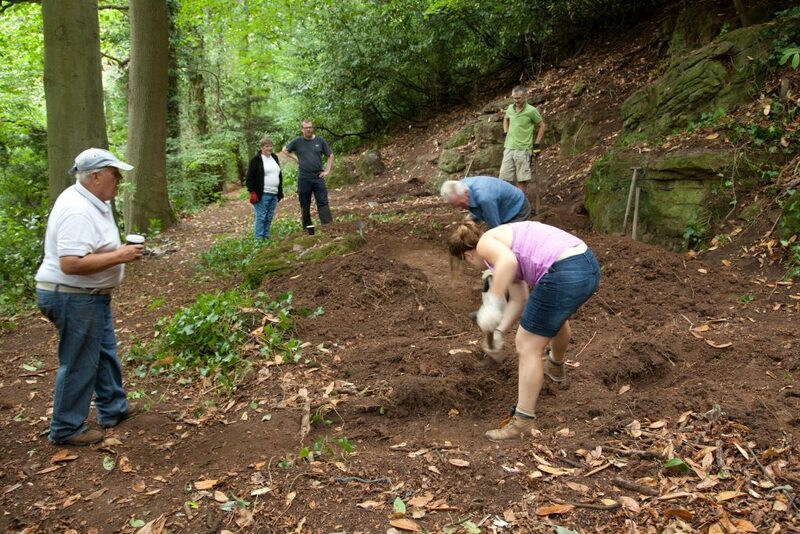 If structures, or other designed garden features once occupied this site there was no identifiable remains left to be discovered by our volunteers. It was not practical to continue excavation directly down to find the natural bedrock which was so clearly exposed in the surrounding area,though future exploration may help our understanding of the natural geology and topography, and how it might have been utilised and adapted by Georgian gardendesigners. Penpole Point, at the far western extremity of the estate, has been a popular vantage point overlooking the Severn for generations. The stone dial was erected there by the Merchant Venturers as a shipping mark, but became the focal point of innumerable rambles through the parkland from the Georgian period onwards. Until the last few decades the romantic views obtained from the dial continued to attract visitors, but sadly the views have been gradually lost to rampant tree growth. A few recent discoveries illustrate the past popularity of the Point. Perhaps two of the most enjoyable are a couple of stereoviews taken by a private individual around 1900, a single view of each of which is shown here. 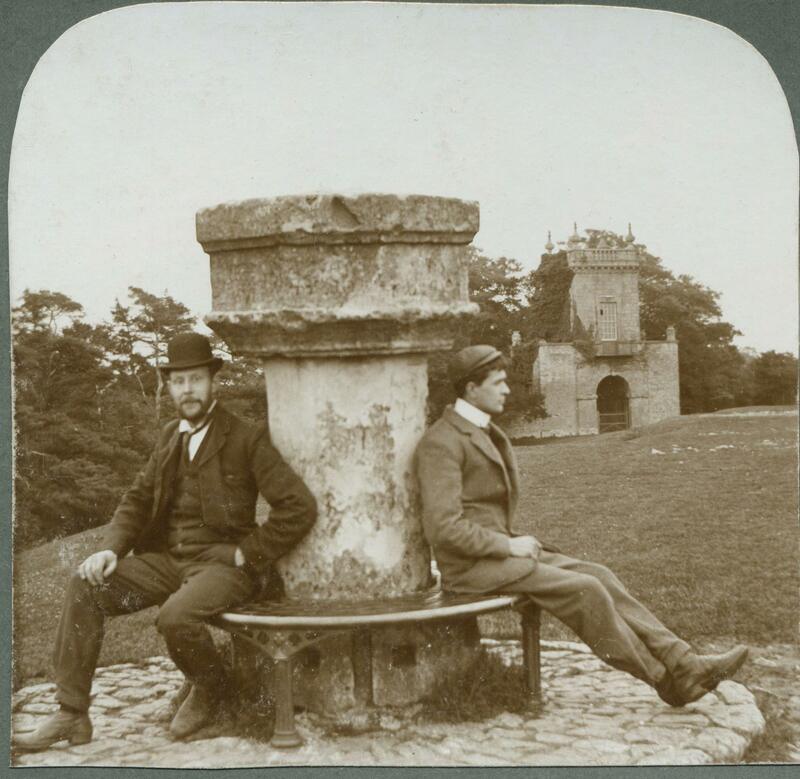 Far from the stuffy demeanour of the usual Victorian photograph the two gentlemen are seen first in relaxed pose, then, no doubt after some intense clambering, astride the dial in a gesture parodying the pose of some self-important statue. The two images are fascinating for both their personal insight into the two tourists, but also for the detail of the dial and the long-lost Penpole Lodge in the background. Single images of two stereocscope view of Penpole Point, circa 1890-1900. The Point must have always had a lure for romantic couples to get away from the city and share the views each other’s company. 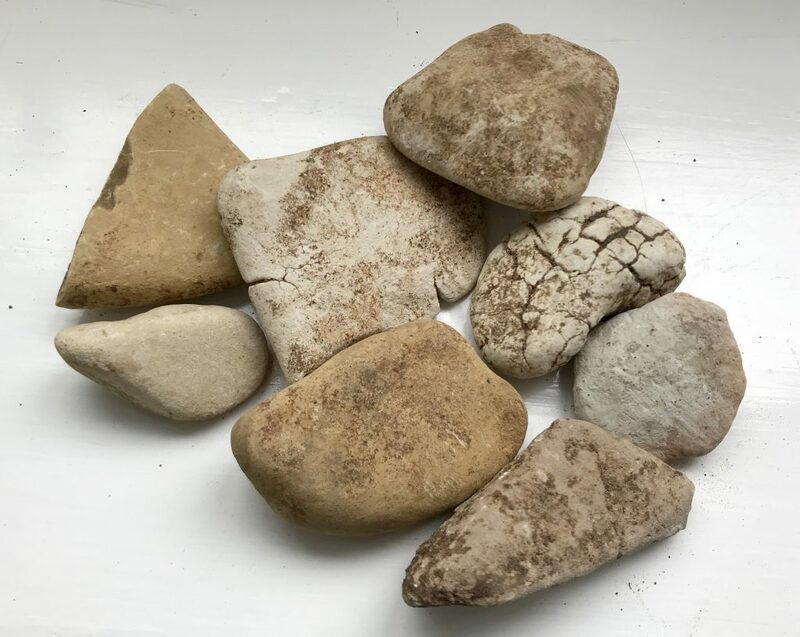 When KWAG posted these on our Facebook page we were delighted that they elicited a response from Mrs Stephanie Keates, and we hope she will not mind us sharing her image onwards. She tells us that the photo was taken in 1964 when she and her husband-to-be were courting and that they have recently celebrated their Golden Wedding anniversary. The fame of Penpole Point was wide, and visitors at the turn of the Century could purchase one of many postcards of the view, or the dial, that were on sale in Shirehampton and throughout the city. 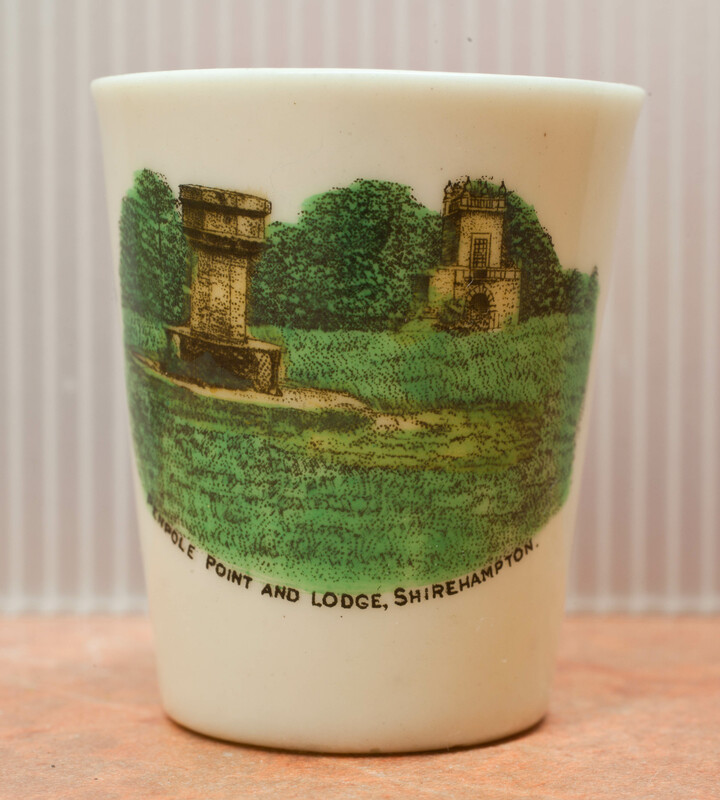 A far more rare souvenir of the estate would have been the little bone china trinket we’ve also recently picked up. The transfer-applied scene depicts the dial and Penpole Lodge, and the whole is crudely coloured by hand. It dates to the first decade of the Twentieth Century. Perhaps this little memento was commissioned by a local shop in Shirehampton and retailed to ramblers returning to the station from their hike to enjoy the view. It is ultimately KWAG’s ambition to re-open some of the views from Penpole Point, but many of the trees that have grown up since the 1960s are far more substantial than what our volunteers are able to manage. The treacherous quarry-like edges on both sides of the point also create safety problems in accessing the area both for assessment and for clearance. Hopefully, at some point in the future, we will be able to fund the opening-up of at least some viewing corridors through the trees. This entry was posted in Uncategorized on August 6, 2018 by David Martyn. KWAG was contacted recently by a well-wisher in the USA. David McGreevy had acquired a photograph from an English seller that he wanted to know more about, and thought we might share his interest. The photo, dated 1873 is a fascinating insight into the Miles Family who lived at Kings Weston between 1834 and 1936. 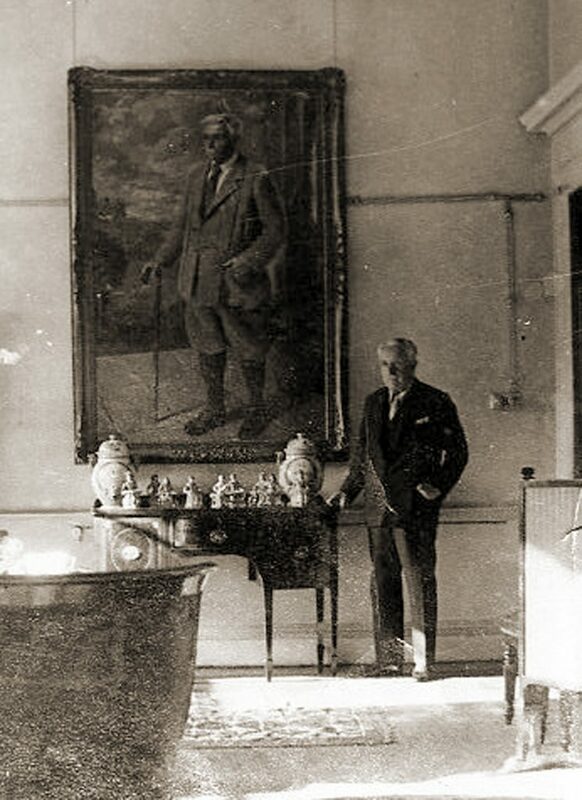 It shows the last two owners of the estate together as father and son. 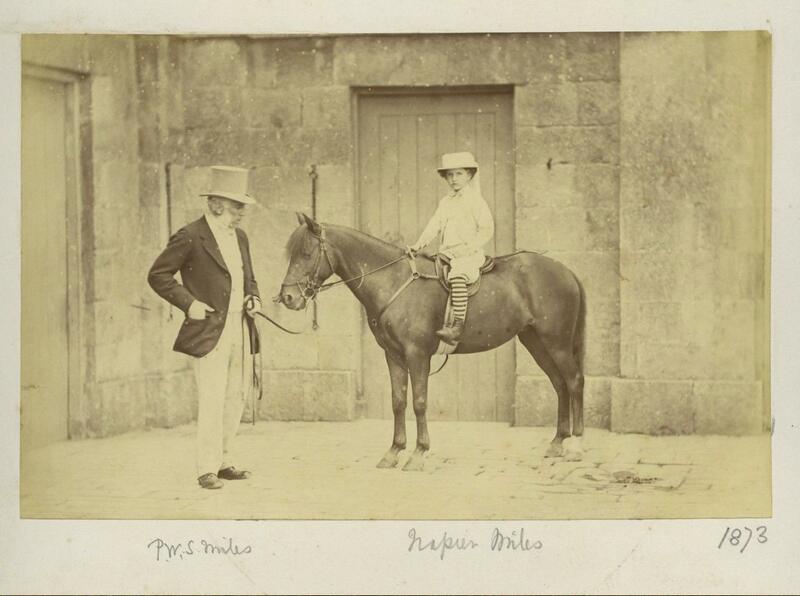 The 57-year-old Philip William Skinner Miles is seen holding the reins of Philip Napier Miles’s pony; the younger miles was just eight when the photo was taken. After a little detective work we were able to identify the location of the photo as the yard of the stables on Napier Miles Road, and have passed this on to its new owner. In return he has happily allowed us to share it with you. A new description of Kings Weston has come to light with some fascinating new detail about the estate dating from the height of its fame. The description comes from an Italian author, Luigi Angiolini, who was drawn to Kings Weston in 1788 by its international reputation. Two features in particular stand out in a translation of his 1790 book “Letters from England, Scotland and the Netherlands”, and are unique insights. 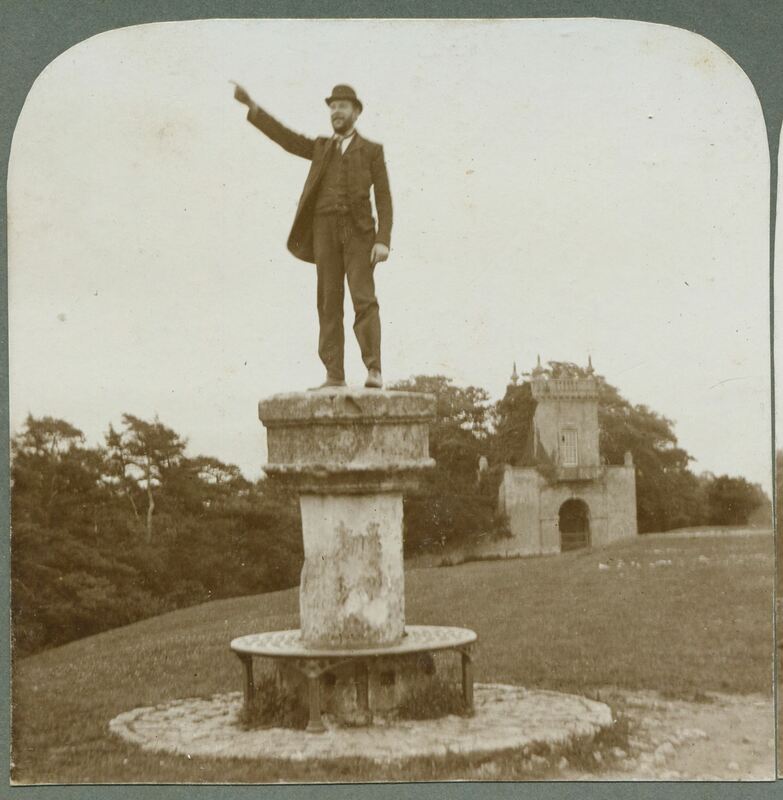 The statue standing on its plinth in the 1920s. Describing his visit to the grounds Angiolini describes the long-lost statue in the Echo as being a “good ancient Roman” figure. 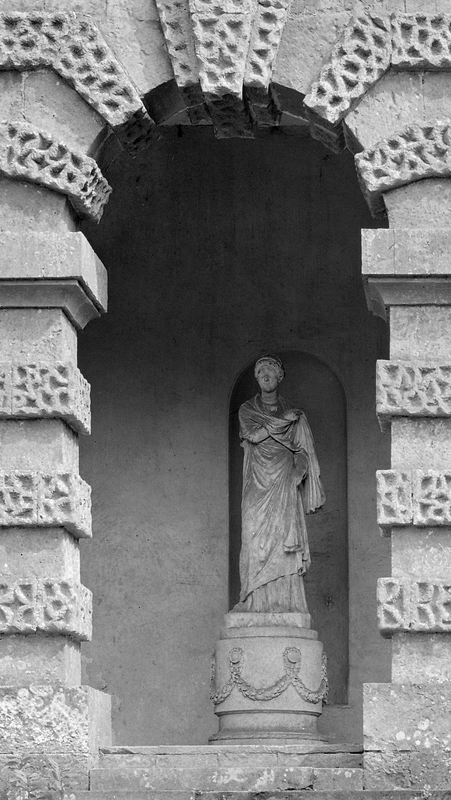 This is the earliest mention of the statue we’ve so far found and adds considerable weight to our belief that it was a classical era state collected on the continent by one of the Southwell family and transported to the estate. Our identification of the pose as conforming to a standard classical portrait model, retrospectively categorised as “small Herculaneum Woman”, always implied that it was not a bespoke commission for the Echo. Had it been we might expect it to have represented a more recognisable deity. We might hope that Angiolini’s assessment of the statue is based on a knowledge of ancient examples which, as he notes, survived in far greater numbers in his homeland; his countrymen lacking the same reverence or value that Gentlemen travelers from Britain attributed to them. Sadly it’s likely that the only confirmation of the statue’s origins might come if it can be located, perhaps still, where anecdotal evidence suggests, tipped of off the terrace wall and into the ash pile close to the house. Angiolini also treats us to another revelation about the landscaped grounds; He mentions an “artificial cave”, made of wood, and hidden in a grove of evergreens. 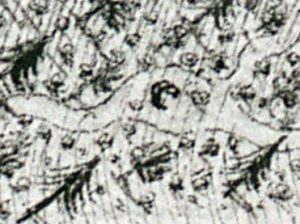 Five years ago we identified an unusual feature in a 1772 map of Penpole Wood which may correspond to Angiolini’s cave, and, at the time, we tentatively attributed it to the landscape designer Thomas Wright. 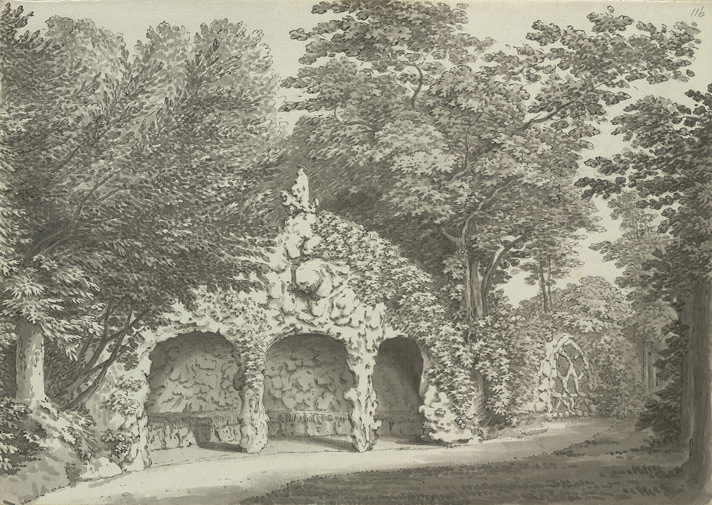 Since then we have proven Wright’s involvement in the design of the Kings Weston grounds and the description of a rustic wooden cave, intertwined with ivy, compares favorably with other known examples of then-fashionable grottoes and seats in Arcadian settings. 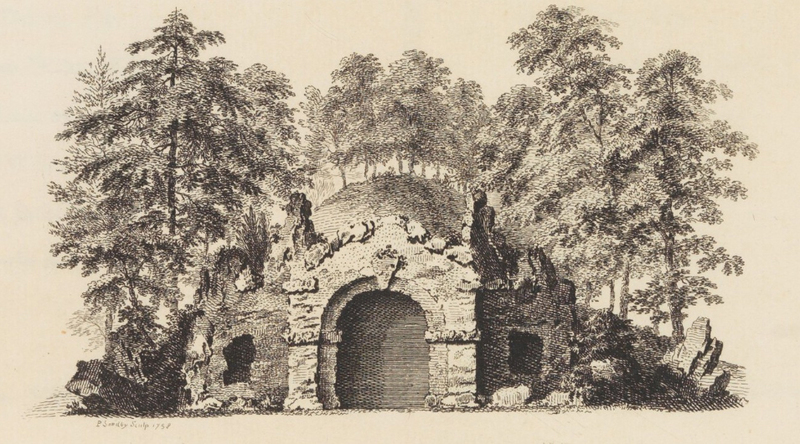 Such examples of “grotesque architecture” were perishable by nature, an intentional contrast to the permanence of classical garden temples, and so often decayed unrecorded, but a quarried area adjacent to one of the paths through the woods corresponds to the map location. We are left to imagine what the structure looked like, but the closest example is the root house at Blaise Castle Estate. This was recorded by the artist Samuel Hieronymous Grimm the year after Angiolini’s visit to Kings Weston. Angiolini doesn’t mention visiting Blaise in his writings, and travels quickly on to Aust and the ferry to Wales. We trust that in describing the example at Kings Weston he was not conflating it with a similar rustic seat on the adjacent Blaise estate.